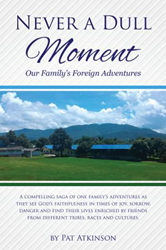 Within the pages of Pat Atkinson’s new book, Never a Dull Moment - Our Family's Foreign Adventures, ($11.99, paperback, 9781498465298; $5.99, e-book, 9781498465304) the author shares his family's foreign adventures in Laos, Vietnam, and other places – a compelling saga of their inspiring journey as they see God's faithfulness in times of joy, sorrow and even danger. This husband and wife team – a doctor and nurse by profession – along with their extended family, find their lives enriched by friends from different tribes, races and cultures. This is enjoyable reading filled with compelling stories that will encourage all readers to have faith in God and spark lots of emotions. This family sets a wonderful example of what it means to be devoted servants of the Lord. The book is a wonderful reminder that God is waiting and willing to do remarkable things in the lives of His children. Pat Atkinson was born in London just before the Second World War. After she became a Christian at the Billy Graham Crusade in 1954, she felt the call of God to prepare herself for full-time service. She trained at Mildmay Mission Hospital where she met Geoffrey, her future husband, and then they both studied at the Bible Training Institute in Glasgow. They married in Laos in 1965 and worked there until the Communists took over in 1975. They moved to Thailand, helping with the refugees fleeing from Laos, Vietnam and Cambodia and also worked for several years in Hong Kong. Now they are back in Thailand working with the Karen. In 2002 they founded Chrestos Mission with a four year Bible Program and the Home of Peace and Joy for boys in need. Xulon Press, a division of Salem Media Group, is the world’s largest Christian self-publisher, with more than 15,000 titles published to date. Retailers may order Never a Dull Moment - Our Family's Foreign Adventures through Ingram Book Company and/or Spring Arbor Book Distributors. The book is available online through xulonpress.com/bookstore, amazon.com, and barnesandnoble.com.